This arrived in my Twitter DM literally minutes after I had published this podcast. I’ll submit a list of questions over the weekend and Neil Ferreira / SAFcoin can respond and I’ll include in next weeks podcast. 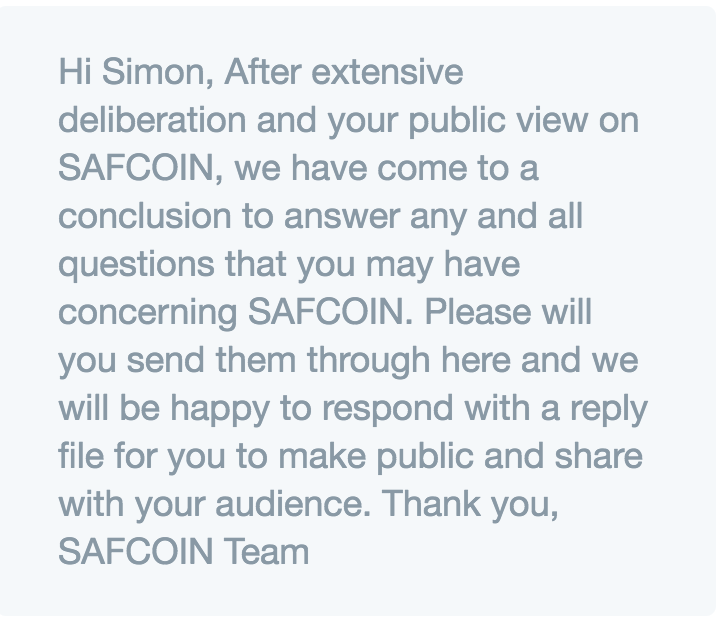 Safcoin finally responded to my caution around their ‘coin’ with a lawyer’s letter. You can read our response and see the letter here. One possible correction is the source of the coins. I stated that Neil Ferreira had created them via cryptocoincreator.com and he Tweeted me a link to Etherscan.io for Safcoin. Not sure if that means it wasn’t created by cryptocoincreator.com but the new information does suggest there are NOT 222billion coins in supply. The Etherscan.io link shows 10million coins total supply rather than the 5million the website has been promoting, but I see Neil Ferreira updated his white paper on the day of my initial podcast to reflect this new 10million coins in supply (as well as a number of other changes to the white paper). Shoprite* (JSE code: SHP) results show a very tough environment hurt by a number of issues. One of these issues is low or negative product which hurts as base costs rise faster than products squeezing margins. But on that point the operating margin remained at 5.5%. The market is hating the CellC and Blue Label (JSE code: BLU) results and the stock is off 8% on Tuesday and another 10% today (Wednesday). Many are saying that it is over done with some 120c of core HEPS making for a PE of around 5x. Maybe it is a bargain but we have also seen bargains become even more so and eventually go bust and CellC certainly wants lots more cash. For me, I do not like telco’s so am not interested either way. Is Famous Brands* (JSE code: FBR) looking to exit their Gourmet Burger Kitchen misadventure in the UK? A SENS last week certainly seemed to indicate it and after promising to turn things around a trading update last week suggests it is still losing some R1.5millon a week. Exiting a bad investment is certainly something I support, but I also support people taking responsibility and the current CEO could claim he wasn’t he boss when this was done – but he was still a senior exec as COO. So any heads to roll? Truth is it is tricky because then a company may lose one or more high quality senior execs if we roll heads every time something goes wrong. But are they quality if they can err this large? Are there surely not other of equal quality who can replace them? Or is this a one off and something we should forgive them for? Truthfully it is a tricky question, but it needs to be transparently dealt with, not just swept under the carpet. S&P500 has hit it’s longest bull market ever. 3,453 days without a 20% correction (since March 9 2009). Understanding the SYGWD – a locally listed ETF making serious returns as apposed to our market. We’re getting a lot of questions about the Fed Group impact farming offering as well as buying cows as alternative forms of investments. The questions are always if this is a good idea and my answer is generally – why? I think there perhaps are two main reasons. Firstly, novelty. Who doesn’t want to own a hive of bees or a slice of a cow (not to be confused with a steak – that you eat). Second is that the local market has delivered zero returns over the last many years so we seek out other ways to generate returns. Now sure, but the real point is where do these sort of investments fit because make no mistake they are alternative investments, or as Kristia would say on The Fat Wallet Show, stuff you buy with your FU money. Alternative investments is that small section of your portfolio (5%? maybe 10% if you wanna be wild) that are outside of traditional investments such as we buy on stock exchanges. In the olden days you’d by gold, carpets, art or wine. Heck for a while in the 80’s it was all about buying shipping containers. These days it seems to all be about crypto currencies and now bees. The theory here is that as alternative investments they are not correlated to normal investments so may survive crashes better. But in truth they often crash as much (if not more) as a crash reduces liquidity so the alternatives get sold as people need cash and alternatives being typically less liquid can crash harder. It is also important to understand the risks here. The biggest risk is the newness. These may be backed by real institutions but this is totally new territory for everybody and we’re simple not sure how they end up turning out. Further we get all sorts of regulatory protection from listed assets and lastly we are simple not experts on these alternative investments so we have to rely on other ‘experts’ for guidance. As a last point the issuers of these alternative investments make reference to potential returns, but as always there are no guarantees on the returns at all. What happens if somebody else eats your cow or the bees fly away? Personally I have no alternative investments. I don’t see how they’ll improve my portfolio and they add risks I am not an expert on. Arrested Development is starting a Bee business.